It can be overwhelming looking for nursery design ideas, especially if you want to wait to find out what gender your baby is. The main thing is that it should be both fun and functional – but you should also remember that how your child and you use the bedroom will change quickly, so its decor will need to be easy to update, too. Check out these ideas – and our well-tested advice – to get your baby's nursery design just right. For practical advice, find out how to design a nursery. If you are a sucker for the baby pinks and blues that are the go-to colours for nurseries, why not give these colour schemes an update with contemporary, muted paint shades? Think duck-egg variations of blue and dusty, barely-there pinks. Still sweet, but with a contemporary twist. Be inspired by more paint colour schemes for kids' rooms. Want at least the illusion of peace and tranquility in the nursery? Nothing beats a classic all-white scheme for its ability to hold a room together and create an easy-going, Scandi ambience that's so easy to update. A contrasting floor will prevent the room from looking washed out. Want to match the look in your own room? Don't miss these Scandi bedroom design ideas. It's amazing how quickly a baby's room becomes a toddler's bedroom and play space, so why not decorate it with the future in mind? Choose bright, bold colours for a contemporary, fun, feel, and don't be afraid to experiment with eye-catching patterns – a mural will help to create a graphic centrepiece. See the latest mural designs for every room in your home. If your nursery is quite small or awkwardly shaped, enhance the space visually by painting one wall in a bright colour, in contrast with an otherwise neutral scheme. This will make the wall an attractive focal feature. Be careful not to use too many colours in a small very small nursery, though, or it will look busy not restful. Find out everything you need to know about creating feature walls in our design gallery. Like the baby pink shades, but don't want to commit to an all-pink nursery? There's a simple solution: try out one wall in pink, keeping the rest of the decor neutral. Wallpaper is the easiest way to add a bit of fun and texture to an otherwise plain room; wallpaper also works wonders for cheering up a room that doesn't get enough light – just be sure to pick a light-coloured design. See lots more gorgeous wallpapers for children's rooms. 7. Match wallpaper and curtains – it can work! Matching window treatments to walls can work really well in a nursery, where the same rules as the rest of the house don't really apply. So long as your colour scheme isn't too crazy, an abundance of prints will look cosy and cute. Discover the right ways to mix and match patterns and plains. Pastel shades can look a little dull and clinical in rooms that get little light; a good way to compensate for a lack of sunlight is painting your nursery in a sunny and warm shade; think a rich, honeyed yellow or a zesty lemon hue. The bonus? It's gender neutral, too. Find out how to decorate north-facing rooms to make them feel warm and welcoming. If your nursery is on the ground floor or overlooked, and you want to create a space that is private but still lets in natural light, window film is a great solution. Choose window film types that let in maximum light – some types let in as much as 90 per cent. These 10 wonderful window film ideas will give you plenty of inspiration. To add a bit of interest to a neutral nursery decorating scheme without having to DIY, hang a few pretty prints. Easy as pie, and easily swapped when your child gets old enough to choose their own. Find out how to hang pictures, art and photos to create a gorgeous gallery wall. 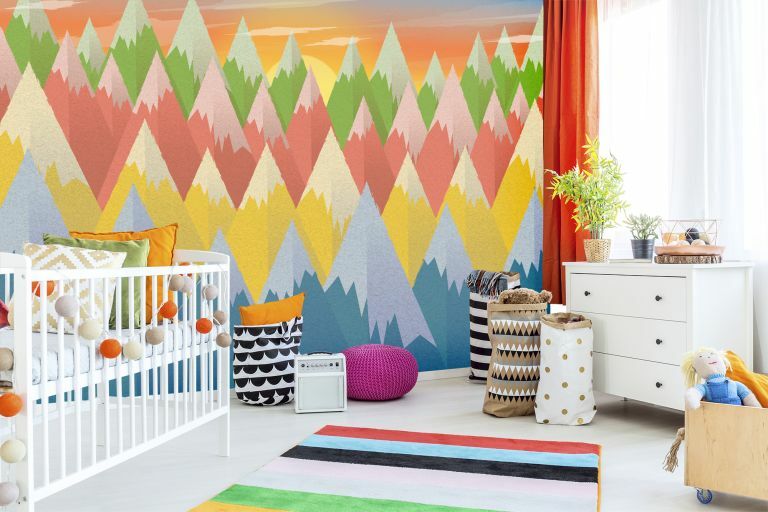 Delight your new baby with a riot of colour and texture, turning the nursery into a fairytale landscape with a mural. They come in a wide variety of patterns and colours, from bright and bold, like this one, to more neutral palettes to photo realistic scenes. Want an easy DIY project for the nursery? Get yourself some lovely wall stickers! They take minimum effort, but have lots of impact. Just be aware that taking them off might be harder than putting them on, so be prepared to redecorate eventually. Why have just one or two colours in a nursery, when more will create added warmth and interest? The trick to colour blocking in a nursery is keeping the tones of the various colours the same (for example, combine warm shades of pink, apricot, and lilac, but avoid anything too cool). That way the room will feel calm and spacious. Find out how to colour block with these inspiring ideas. Pick a nursing chair you'll find comfortable now – but can fit into your home's colour scheme in a year or so's time when you no longer need it in your child's room. We're talking washable or removable covers in a neutral, go-with-anything shade. Find the best nursing chairs to suit every scheme, style and budget in our guide. Invest in a sturdy changing table now – but pick one that has built-in storage that's flexible for the future. It might hold nappies now but it won't be long until you're stashing toys in it. Find great kids' room toy storage and book storage to keep the nursery neat. As you've (hopefully) come to discover while reading through our nursery design ideas, designing a room fit for young children doesn't have to mean sacrificing your sense of interior style. This Mid-century Convertible Crib from Pottery Barn Kids not only has a distinctly Mid-century feel to it, but has the added benefit of being made from sustainably sourced timber. Complete with geometric patterned sheets and chic wall art. Designing a nursery that will suit your child as they grow is a good idea if you're looking to save money in the long run. Storage should be central to a nursery intended to stand the test of time. We love the sleek and stylish feel of the String Storage System from Skandium, which is perfect for displaying their (ever increasing) selection of toys. Find more nursery storage solutions in our buyer's guide.